You know those four somewhat obnoxious guys at the end of every street corner walking around trying to have a good time? They made a movie about them! 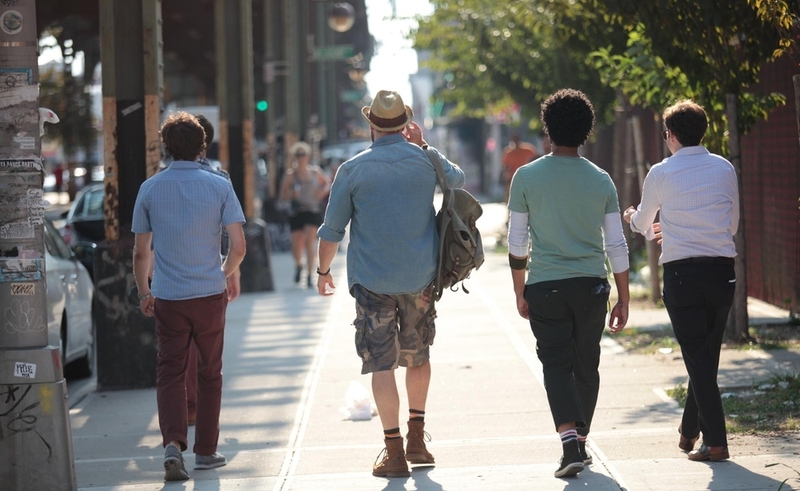 Growing Up and Other Lies follows friends Jake (Josh Lawson), Rocks (Adam Brody), Billy (Danny Jacobs), and Gunderson (Wyatt Cenac) as they reunite to walk across New York City one last time before Jake takes off to further his art career and, hopefully, his life. Along the way, they encounter many detours, such as Jake’s old flame Tabatha (Amber Tamblyn), all while talking about their regrets and what they want out of life. The first and most important thing to note is that these four are actors. Josh Lawson, in particular, was engaging, caring, and tried to bring something to the story. Wyatt Cenac also had a few funny moments, show casing his talent from The Daily Show with Jon Stewart. I hope that these actors land more movie roles because they really deserve the recognition. However, as for this movie, they weren’t given much to work with. Growing Up and Other Lies shifts tones frequently and never feels consistent or confident in its story. It’s almost as though there isn’t a core theme to tie each detour and character together. The film tries to talk about embracing adulthood and not having everything figured out yet, but it doesn’t really address this theme in a particularly engaging or original way. It feels run of the mill and as if inspired by one of Richard Linklater’s films without fully grasping what makes his films so compelling. The film feels bland and when it’s time for the characters to feel or have a moment, not only does it come off unnatural, like someone suddenly flipped a switch but it also doesn’t feel earned. The four characters are very average, not unlikable in any way, but also not very engaging either. Jake is the main focus of the four, but his dilemma and journey seems to be thrown away near the end, with the last line of the film saying ‘whatever’ to any plot or meaning that could be taken from his experience. I know Darren Grodsky and Danny Jacobs Growing Up and Other Lies have the talent to make a good movie. The character’s dialogue felt natural throughout and there are moments that work here, which tells me that, with the right idea, they can pursue a great screenplay. But while not a bad movie there is not much to salvage it from feeling bland. There’s nothing particularly special about it, aside from some well-done acting. Perhaps these filmmakers need some more growing up of their own before we see that great film they are capable of making.